When Opéra de Montréal artistic director Michel Beaulac heard tenor singer Kristian Benedikt perform several years ago at a gala, he knew he had found his Otello. Otello sings of his victory over the Turks. Photo by Yves Renaud. The gala, which celebrated the 200th birthday of composer Giuseppe Verdi, would be the turning point in which Beaulac would realize he could bring his favourite Verdi opera to Montreal. “That is why I planned Otello actually, because you don’t plan a production of Otello if you don’t have a very serious candidate for the title role,” said Beaulac. However, you need more than just Otello to bring Shakespeare-come-Verdi’s masterpiece to life. Having stellar singers for the spiteful character of Iago and the innocent Desdemona are also a must. For those who never read Shakespeare’s Othello, the opera is about an outsider, called Otello, who has worked his way through the military ranks to become general. When he overlooks Iago for a promotion, Iago sets off on a vicious plan of revenge. He manipulates Otello into believing that his innocent wife, Desdemona, is unfaithful. Blinded by his own insecurity, Otello murders his wife, only to have Iago’s manipulations revealed moments after her final words. 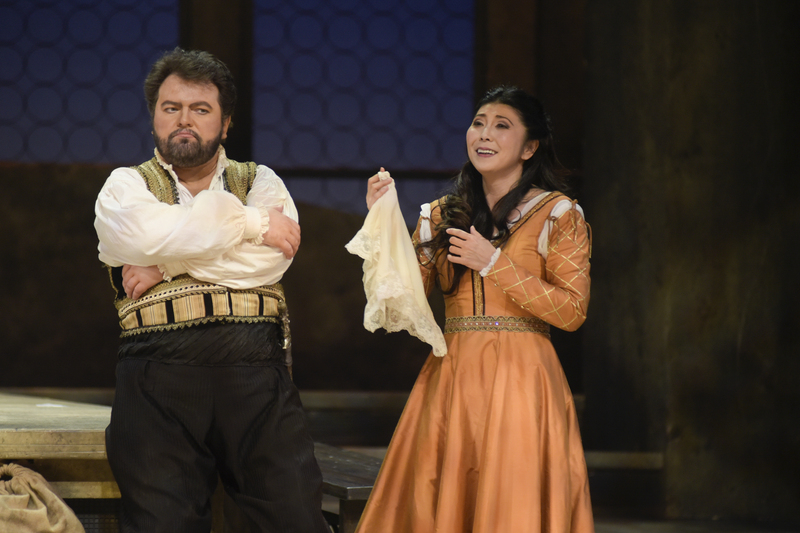 Consumed with grief, Otello takes his own life. “Dramatically, musically … [Verdi reached] the summit of his art at the end of his life with Otello,” said Beaulac. Desdemona is played by Hiromi Omura. Photo by Yves Renaud. Iago is performed by Aris Argiris, whose acting and baritone mastery let him steal the show. “He really has a presence that is overwhelming and he has the voice to match. The colour of the voice—there is some brassy, very resonant, very powerful outreaching, commanding, colour to his voice that makes him musically, certainly, an ideal Iago,” said Beaulac. Argiris reincarnates the evil of Iago with full body projections of disgust, hatred, spite and disdain so powerful you fear him casting his eyes out to the audience, lest that hatred fall on you. His frequent asides to the audience keeps the spotlight on him, and builds tension between characters by reminding you he is the master manipulator here. “You need this drive, this projection, this intensity and this inner force to make [Iago’s] character believable on stage,” said Beaulac, and Argiris certainly delivered—marked by the audience leaping to their feet for a round of applause that resonated loudest of all at the end of the show. Hiromi Omura plays Desdemona, whose innocence acts as the perfect foil to Iago’s palpable evil. “Desdemona is a warm, expressive, honest, true to life, ingenuous character that Hiromi portrays with such ease and facility because that is her personality,” said Beaulac, who has similarly been casting Omura as Desdemona for years. Mistrust breaks the once-loving couple up. Photo by Yves Renaud. “When I asked her to come play [the character of] Butterfly here, one of my objectives, [within] four or five years, was to have her sing Desdemona here in Montreal because, to me, she is the ideal Desdemona in every aspect,” said Beaulac. With three potential powerhouses cast in his mind already, Beaulac didn’t hesitate when he found a time when all three singers were free. The result is a powerful performance that keeps the audience at the edge of their seats for the entire show. A simple set design of stone pillars and gauzy hanging white sheets allow the stage to be transformed from a harbour facing a tempest-plagued sea to a city street packed with 48 merry, celebrating choristers, to a quiet bedroom with an ominous white bed seemingly glowing next to Desdemona during her final moments. Guy Simard, who designed the lighting for the show and Jamie Nesbitt, who designed the video, project crashing waves and dimly lit city streets on the hanging sheets to expertly set the scene. This simple set design created one of the most amazing character entrances I have ever seen. Desdemona, who the audience now understands is doomed, has just fallen asleep on her pure-white bed, clutching her wedding dress in hopes it will defend her from her crazed husband. The audience’s attention snaps to the gauzy white sheet that hangs as her headboard while Otello, with his vicious-looking sword languidly slung over his shoulders, slowly approaches her bed from behind the curtain. His silhouette is so menacing with the glint of his weapon visible through the curtain that I almost called out to wake Desdemona, to urge her to run, to escape. It is this connection the audience develops with the characters which makes Otello such an amazing tragedy, said Beaulac. We all identify with the different characters throughout the play, said Beaulac, because we are all sometimes the victim, the tool of manipulation or even the manipulator. But Otello, the outsider, is whom everyone connects with the most. “We identify with him subtly because we are all different, and all have individual personality traits that make us different. So [Otello’s character] is an expression of everyone’s solitude,” said Beaulac. Treat yourself to a night of glamour, drama, sophistication and art for a night to remember at the Opéra de Montréal Feb. 2, 4, and 6. Tickets range from $22 to $144.